While there have been no reports of canine influenza in Alabama, other Southeastern states are seeing cases, and Auburn College of Veterinary faculty want animal owners to be aware of symptoms of the disease and act quickly. Georgia, Florida, and Tennessee have seen cases of H3N2, the same viral strain identified in a March 2015 outbreak in the Chicago area, making dogs sick with fever, coughing, sneezing and other respiratory signs. Many of these dogs experienced decreased appetite and some even progressed to secondary pneumonia. “While we’ve not seen any cases or had reports, it is important for animal owners to be aware of symptoms, especially as they travel with their pets this summer,” said Dr. Lenore Bacek, an assistant clinical professor in the Emergency and Critical Care Service in the Wilford and Kate Bailey Small Animal Teaching Hospital. “Canine influenza is highly contagious, and dogs seem to be able to spread it even before they are clinically ill,” she added. Typical symptoms of canine influenza include: Coughing; sneezing; fever; clear nasal discharge that progresses to thick, yellowish-green mucus; rapid or difficult breathing; loss of appetite; and lethargy. If you suspect your pet may have canine influenza or has been exposed to it, Dr. Bacek recommends a phone call to your primary care veterinarian. 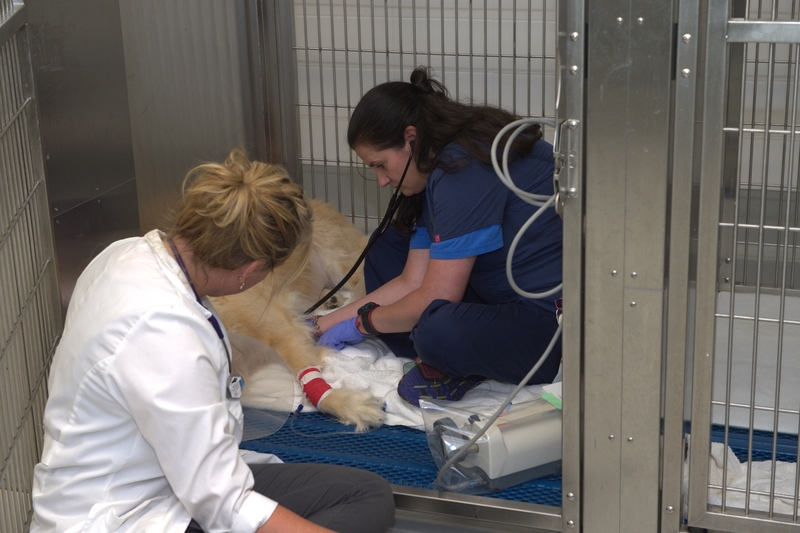 After hours or in an emergency situation, facilities like the Emergency and Critical Care Service, which is open 24 hours, can assist pets and animal owners. Dogs considered to be at highest risk are those that participate in social activities or encounter groups of other dogs: boarding and grooming facilities, dog parks, dog shows and shelters are all potential venues for transmission. The American Kennel Club (AKC) issued a statement to dog show exhibitors in the Southeast, warning of reports of sick dogs from Georgia and Florida dog shows. The AKC is recommending that if a dog seems ill, it should not be exposed to other dogs and should see a veterinarian concerning the possibility of influenza. Any dog showing signs of respiratory disease should see a veterinarian as soon as possible. Veterinarians with patients that may travel, especially into or out of Southeast, should consider offering a canine influenza vaccine. Any dog that resides in (or has recently traveled to) the Southeast should be closely observed for signs of respiratory disease. Any dog that becomes ill with canine influenza should be isolated for at least 21 days after illness to limit the spread of the virus. The College of Veterinary Medicine is the South’s original and nation’s seventh oldest veterinary medical program, celebrating 125 years. We prepare individuals for careers of excellence in veterinary medicine, including private and public practice, industrial medicine, academics, and research. The college provides programs of instruction, research, outreach, and service that are in the best interests of the citizens of the state of Alabama, the region, the nation, and the world.